A pop up space as a sacred interruption and a much needed refuge from the city’s chaos. It’s also a temporary and elusive structure using nature as its main design element. Activating its surrounding environment by acting as an element of urban acupuncture. If architecture is the language of the city, then this space speaks words that heal, like a mantra/meditation. An architectural experimental laboratory emphasizing material reusability, by inhabiting unused spaces in the city and engaging with the neighboring community. During the experimentation phase, the architects also constructed a space for community theatre activities. Low cost living in rural areas of San Miguel de Allende. The project seeks a design solution that responds to the relationship between the interior with the exterior. It’s an attempt to reintegrate the construction waste, including discarded furniture with the construction elements in an attempt to recycle and reinvent materials. A progressive construction project that looks to intervene in the redesign of an old colonial house in downtown Quito. Completed in stages and through “auto-construction”, that is, the architects themselves are also part of the construction process. The tenants participation in the construction is used as an exchange for rental time. A series of sketch workshops in the streets of Guanajuato City. 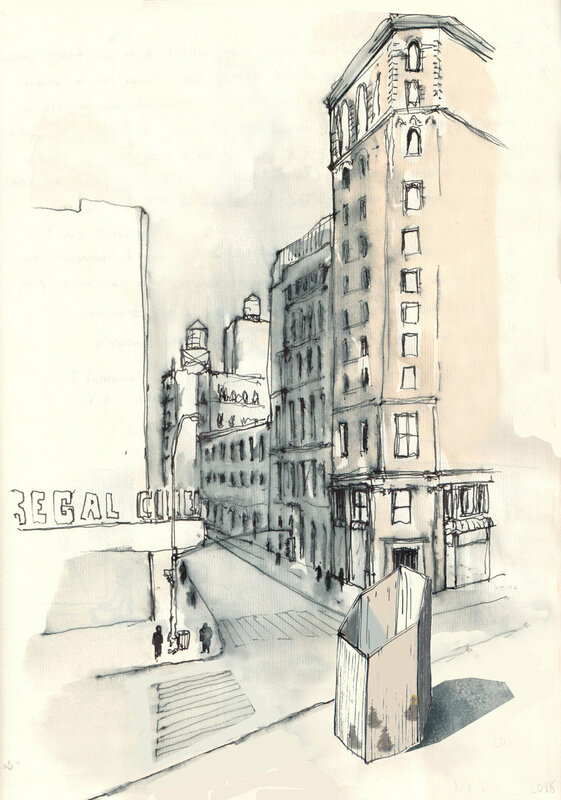 Each Friday, the group would go to the streets to understand the space and the city through their eyes and hands, reinterpreting what's perceived in their sketchbooks. These offerings are created in collaboration with sound practitioners and also revolve around themes of impermanence, phases and cycles. A variety of wellness experiences that are movement/yoga related along with other modalities such as reiki and sound that ask the participants to consciously relax. Participants are asked to set intentions themed around the lunar cycles and themed around the cosmos. “The Naval Cemetery Landscape is a project of Brooklyn Greenway Initiative to create a publicly-accessible green space which will revitalize the native plant and pollinator populations in the region and Its design includes a raised walkway to allow visitors to enter the space without disturbing the hallowed ground. She was tasked to create and hold “space” for pop up yoga classes in a Brooklyn park. It differed from a regular studio class because of the invisible space and intimate experience that is created with the headphone technology. The space co-created, with no visible “studio”, became intangible after class. Thesis project at ITP (Interactive Telecommunications Program) - Jewelry made of live plants. Explores ritual and connection to nature. Jewelry is a personal item carried on our bodies with no practical function other than for decorative or mystical purposes. What does it imply to carry a little piece of nature?